PoPville » Park Place Ribbon Cutting Ceremony (Above Petworth Metro) Plus Some Details on Retail Revealed! 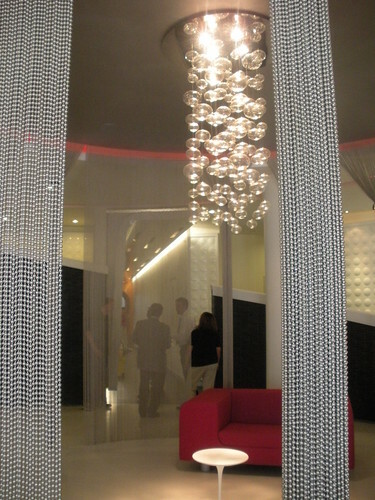 Park Place Ribbon Cutting Ceremony (Above Petworth Metro) Plus Some Details on Retail Revealed! 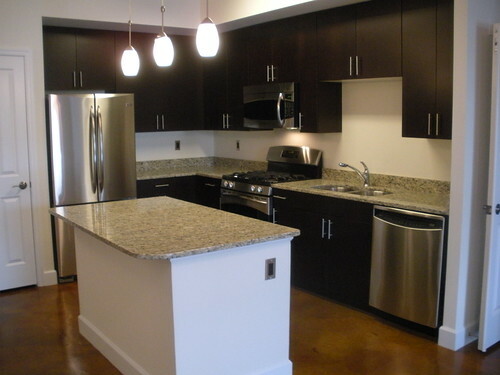 On Wednesday the new building, Park Place, above the Petworth metro was officially unveiled. It brought out quite the representation from the DC government. In addition to Mayor Fenty, Council members Bowser, Graham and Kwame Brown were in attendance. Some highlights from the remarks. 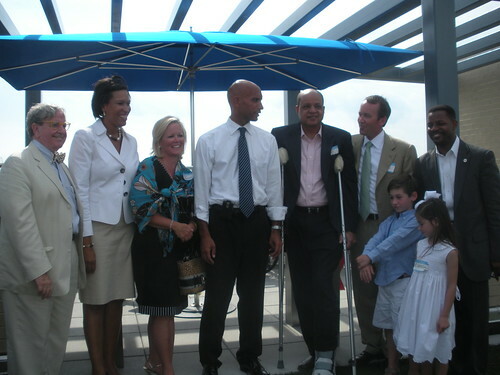 Mayor Fenty said the day signaled that “economic development on Georgia Avenue had finally arrived”. He continued, “the days when stagnation reigned on Georgia Avenue are over”. And he gave a lot of praise and recognition to the Donatelli (the developers) family for their vision. “Donatelli is not afraid to invest in neighborhoods that other people have written off”. 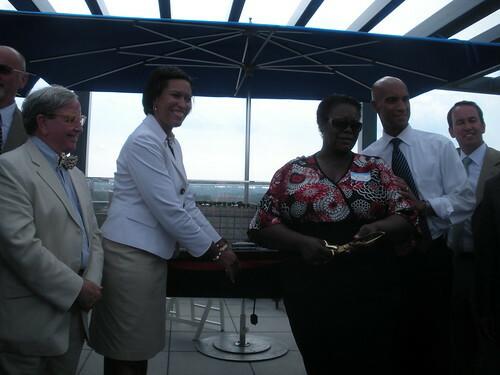 Ward 4 Council member Muriel Bowser said, “My breath was literally taken away when I stepped onto this roof”. She continued, “This is just the start for things to come on Georgia Ave”. She also noted that this project captured the best of green development as it clusters people above the metro with easy access to commute to work. Bowser also lauded the community for their involvement in supporting this project. Before the community got involved this space was slated to become a municipal property. Ward 1 Council member Jim Graham said, “Who would’ve thought that we would have this kind of building at Georgia and New Hampshire? The neighborhood knew that this building could be here, that’s who knew”. Graham also noted that the project had “the benefits of transit oriented development in the best sense”. Sadly, I passed out a bit from the blaring sun when Council member Kwame Brown said a few words. But he basically echoed the previous comments. I revived a bit when Chris Donatelli took the mic and started mentioning the coming retail. (Some info I found out after the official remarks.) There will be a cafe/coffee spot, 2 sit down restaurants (one from Gillian Clark formerly of Colorado Kitchen and the other possibly a Thai/Sushi spot). He said the retail may resemble some of the spots on U Street (in the Ellington building) as some of those folks are considering opening up second or third spots in Petworth. There are also discussions to bring a wine store in most likelihood the folks behind D’vines. There will be 8 retail spots in total. Given the current state of the economy, I think we are very lucky that this project was completed. The place looks pretty amazing. It really sinks in when you hear Mayor Fenty say, “I remember the day when new development hadn’t been built on Georgia Ave. in like 80 years”. As promised after the jump you can find some photos from inside along with a pricing sheet. And here are the prices, though you’re going to have to do some math (and I’m too tired to do math right now) because the prices do not reflect 2 months free rent. The two months free rent can be prorated over the year or you can just get two months free. I was told that after doing the math the least expensive units come to $1,600 per month (not including affordable housing rates). 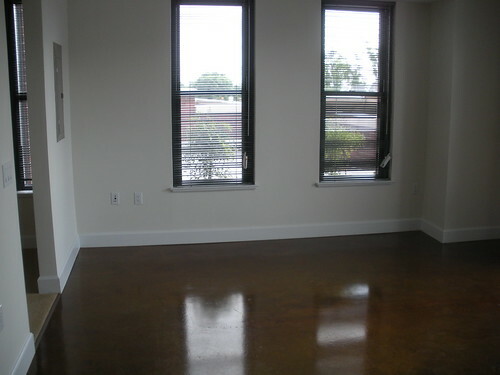 Now remember you have to subtract two months rent from those prices. 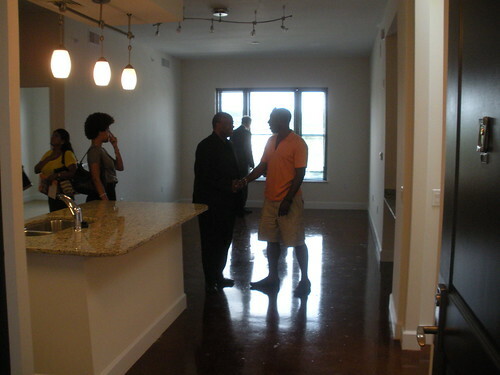 Additionally, 20% of the units are reserved for affordable housing. The maximum income to qualify for affordable housing is $61,000 per year. You’ll have to talk to the sales associates to see if you qualify for affordable housing as this was a ribbon cutting ceremony I wasn’t able to get all the details. WASHINGTON, DC – Mayor Adrian M. Fenty today joined Councilmembers Muriel Bowser (Ward 4), Jim Graham (Ward 1) and Kwame Brown (At-Large), community members, and representatives of Donatelli Development for a ribbon cutting ceremony to mark the opening of Park Place, a new 200,000 square-foot housing and retail project atop the Georgia Avenue-Petworth Metro Station. The largest mixed-used development project along the Georgia Avenue corridor, the $71 million Park Place includes 161 apartment units and 17,000 square feet of ground floor retail space located directly above the Georgia Avenue/Petworth Metro Station. Twenty percent of the residential units will be reserved at affordable rates, and residents will also benefit from 187 underground parking spaces. 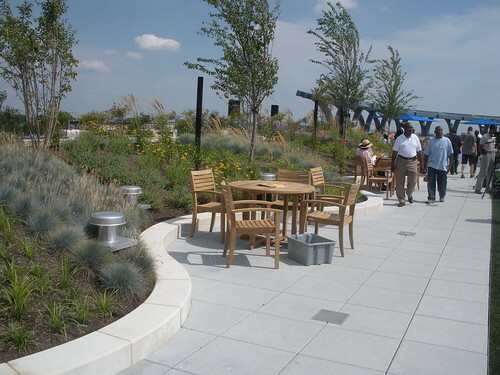 The landscaped rooftop has a sundeck and a bocce green lawn, with panoramic views of city attractions like the National Cathedral, the Washington Monument and the US Capitol. 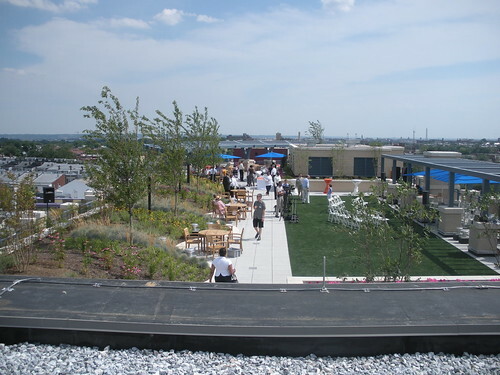 The project also has many environmentally sustainable design, such as energy-efficient appliances and light fixtures, a built-in storm water management system, rooftop plant fixtures for rainwater containment, and white roof tiles that resist heat so the building uses less energy to cool its interior. The first floor of Park Place will offer a mix of national and local neighborhood-serving retail. More than half of the new jobs to be created by the development of Park Place will be filled by District residents. Park Place has already received awards in the real estate industry, such as the 2009 Economic Development Award from the Association of African American Real Estate Professionals (AAREP). The project, which was awarded to Donatelli Development and Gragg & Assoc by the Office of the Deputy Mayor for Planning and Economic Development through a competitive process in 2004, is a joint-venture with Canyon Capital Realty Advisors and Earvin “Magic” Johnson. Donatelli is also making its development mark across the street from Park Place at 3801 Georgia Ave, NW, which will offer 49 market-rate apartments. 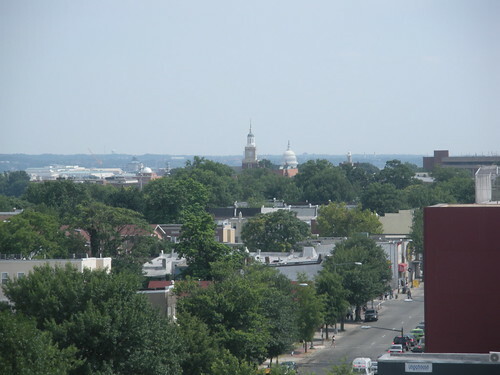 In addition, at 3813 and 3815 Georgia Ave, NW and 3825-3829 Georgia Ave, NW, Donatelli will be performing renovations and constructing restaurants and housing units. Donatelli intends to break ground with the District on these projects in the fall. Dear PoP – What’s Going on at Columbia Road?